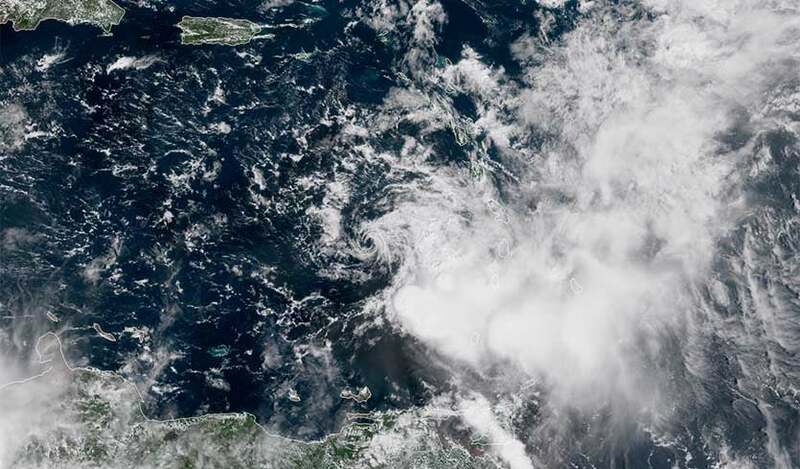 Above: Visible image of Tropical Storm Kirk at 11:30 am EDT September 28, 2018. The low-level circulation center was exposed to view, and all of the storm's heavy thunderstorms were pushed to the east side of the center due to very high wind shear. 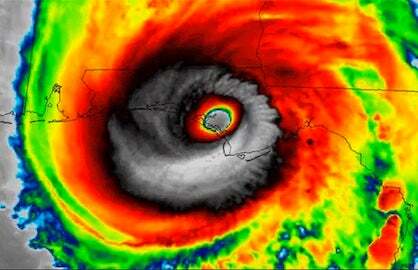 Image credit: NOAA/RAMMB. Tropical Storm Kirk made landfall on the Lesser Antilles island of St. Lucia near 8:30 pm EDT Thursday, September 27, 2018, when the storm’s top sustained winds were 50 mph. 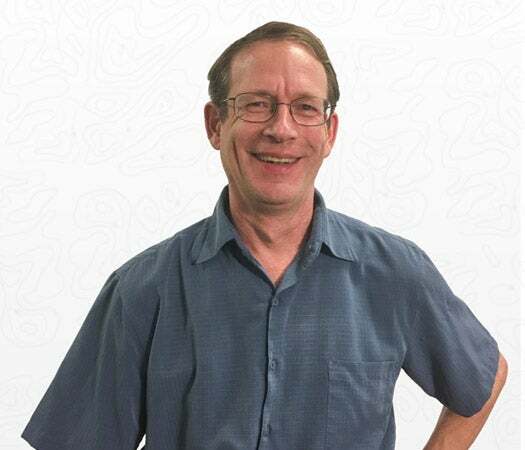 Kirk brought torrential rains to Barbados, where the Barbados Meteorological Services reported 9.5” of rain fell at Charnocks. Two separate personal weather stations in Bridgetown, Barbados received 7.43” of rain and 8.40” of rain from Kirk as of 8 am EDT Friday. 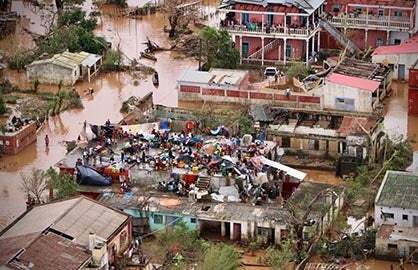 Considerable flooding was reported on the island, but Barbados is relatively flat, and not prone to the mudslides heavy rains often cause on other Caribbean islands. Figure 1. Radar image of Tropical Storm Kirk at 9 pm EDT September 27, 2018. Kirk’s center had just made landfall on the island of St. Lucia. 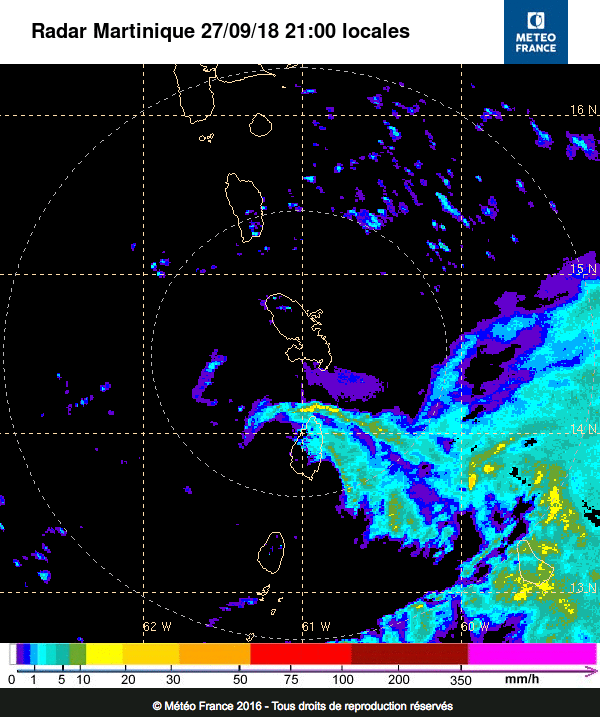 Barbados (lower right of image) was in the heaviest rain region of the storm. Image credit: Meteo France. Moisture from Kirk, in combination with the dynamics from an upper-level low pressure system, are expected to bring heavy rains on Friday and Saturday to eastern Puerto Rico and the Virgin Islands, where a Flash Flood Watch is posted. Heavy rains of 2 – 4”, with isolated 6” amounts are expected. The soils are already saturated in this region, so flash flooding and mudslides are a danger from these rains. Lower rainfall amounts of 1 – 2” are expected in western Puerto Rico. A coastal flood watch is also in effect for Puerto Rico, where dangerous breaking waves of 10 – 16 feet are expected. Kirk was headed west-northwest at 13 mph through the Eastern Caribbean late Friday morning, and the storm’s heavy rains were still affecting much of the Windward Islands, including St. Lucia, St. Vincent and the Grenadines, and Grenada, as seen on Lesser Antilles radar. Satellite loops showed that Kirk’s center was exposed to view, with all of the storm’s heavy thunderstorms pushed to the east side of the center, thanks to strong winds out the west creating very high wind shear of 35 knots. The shear should remain very high through Saturday, leading to the steady dismantlement of Kirk and a death in the Eastern Caribbean over the weekend. None of the models are showing regeneration of Kirk next week over the Western Caribbean, where wind shear is also expected to be very high. Figure 2. 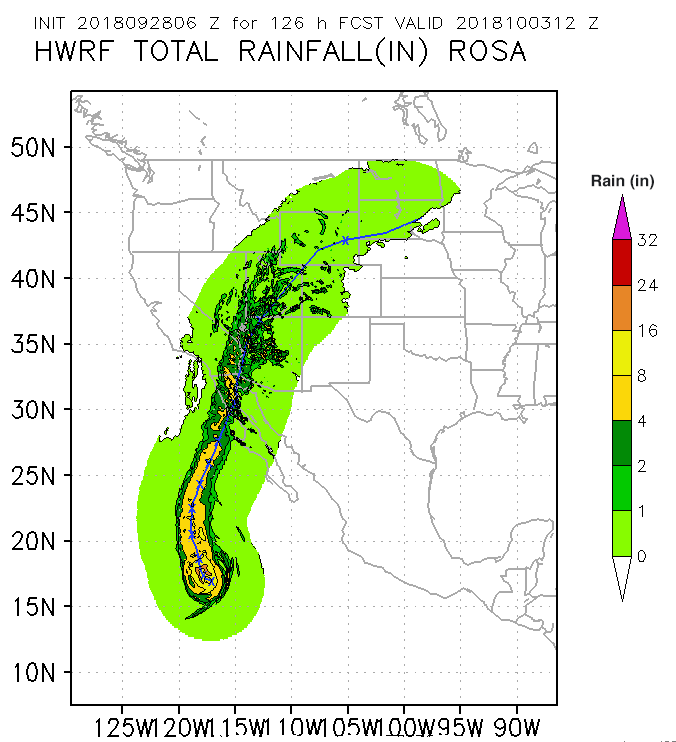 Rainfall forecast for Hurricane Rosa from the 6Z Friday, September 28, 2018 run of the HWRF model. 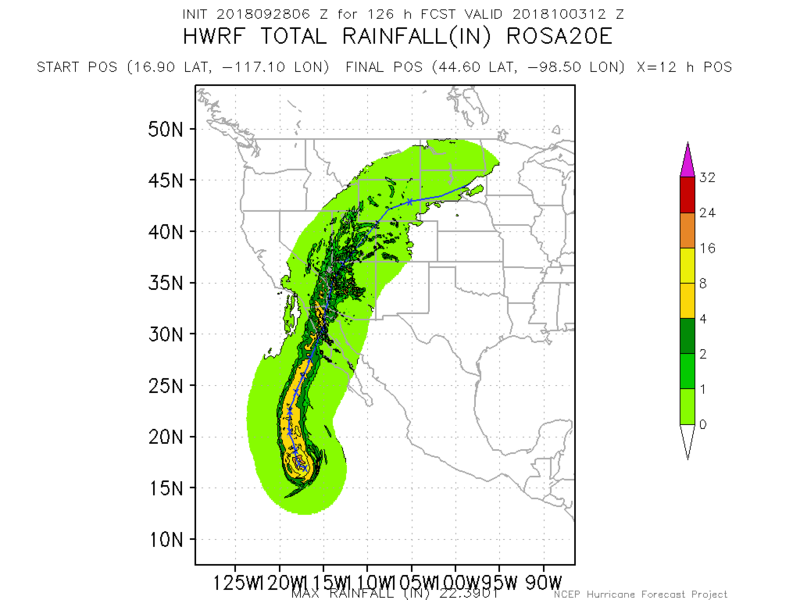 The model predicted a swath of 4 – 8” of rain (dark yellow colors) from northern Baja into southern California and western Arizona. Image credit: NOAA. Hurricane Rosa poised to bring heavy rains to Baja and Southwest U.S.
It’s been an exceptionally busy 2018 hurricane season in the Eastern Pacific, where 17 named storms, 10 hurricanes, and 7 intense hurricanes have formed. An average season has 15 named storms, 8 hurricanes, and 3 intense hurricanes, so we are well past those benchmarks with several more weeks of prime hurricane season remaining. The seventh major hurricane of the season is Rosa, which is rapidly intensified into a Category 4 storm with 145 mph winds on Thursday evening in the waters about 600 miles southwest of the southern tip of Mexico's Baja Peninsula. Rosa is also the seventh Category 4 hurricane of the 2018 eastern Pacific Hurricane Season, tying the record recently set in 2015. With top sustained winds of 140 mph as of 11 am EDT Friday, Rosa is maintaining its strength due to very warm waters with sea surface temperatures (SSTs) of around 28.5°C (83°F) and a moist surrounding atmosphere (mid-level relative humidity around 65%) amid light wind shear less than 10 knots. 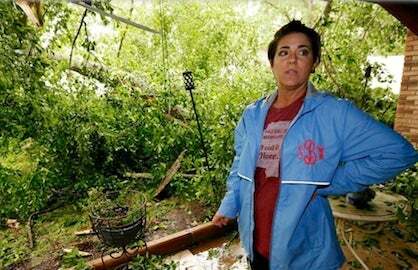 Rosa had weakened slightly, though, due to an eyewall replacement cycle. In classic Northeast Pacific fashion, Rosa should begin to weaken rapidly as it recurves to the north on Saturday night, encountering cooler waters, dryer air, and high wind shear. #Rosa will be responsible for transporting prolific amounts of tropical moisture into Southern California, Nevada, Arizona & Utah early next week. Mexico has been very fortunate this season, with only one landfalling tropical storm so far—Tropical Storm Bud, with made landfall near the tip of the Baja Peninsula on June 14. That luck will change on Monday evening, when a weakening Rosa is expected to hit northern Baja California, bringing rainfall amounts of 4 – 8” and the threat of flash flooding and mudslides. Models indicate a tongue of rich moisture will shoot into the California/Arizona border region beginning on Monday, then spread into much of the Desert Southwest on Tuesday. This moisture will be capable of generating heavy rains of 2 – 4” capable of causing dangerous flash flooding. Some of Rosa’s upper-level energy will get all the way to the Midwest by midweek, where it could help feed another round of heavy rains from Iowa to Wisconsin to Michigan. Figure 3. MODIS visible satellite image of a Medicane located to the southwest of Greece on Friday afternoon, September 28, 2018. Image credit: NASA Worldview. 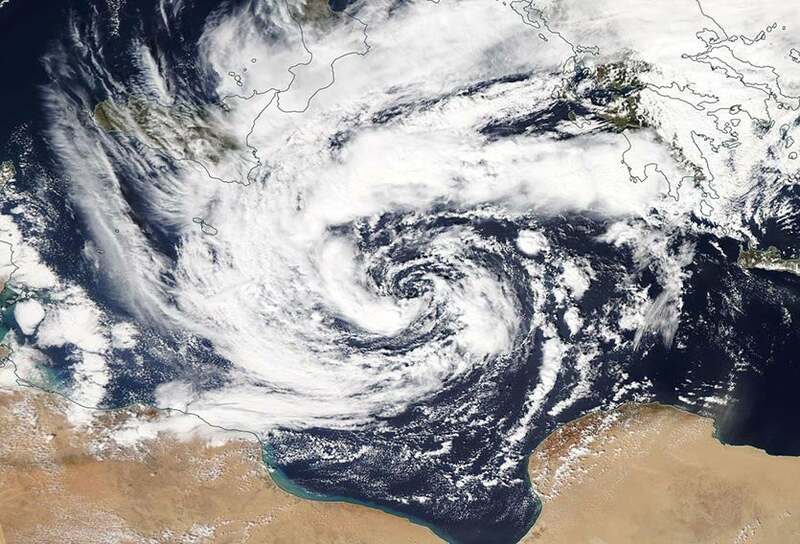 A deep area of low pressure with subtropical storm-like characteristics formed in the eastern Mediterranean Sea Thursday night, and is expected to bring damaging winds, heavy rains, and dangerously high surf to portions of Greece and Turkey over the next two days. This storm, called a “Medicane” due to its hurricane-like structure, is feeding off of waters with SSTs of around 27 - 28°C (81 - 83°F). The storm is expected to move along the south shore of Greece on Saturday, bringing sustained winds of 40 – 50 mph over the ocean and 25 – 35 mph inland over Greece. By Sunday, the storm will weaken due to land interaction and cooler SSTs, and make landfall in western Turkey. The greatest danger from the storm is heavy rain and high surf. According to Severe Weather Europe, recent model runs predict 4 – 8” of rain along the track of the storm, through southern Greece and into western Turkey. Peak wave heights of 12 – 15 meters (39 – 49 feet) can be expected along Greece’s south-southwest Peloponnese and western Crete, where the strongest winds will likely occur. Maximum wave heights of 9 - 12 m (30 – 39 feet) can be expected in the Greek western Cyclade Islands Friday evening, when the Medicane will pass just to the northwest, as it crosses Greece’s southern Peloponnese. In the Northwest Pacific, Typhoon Trami is battering Japan's Ryuku Islands as a Category 2 storm with 100 mph winds. Trami was moving very slowly over the past two days, allowing the storm's powerful winds to stir up cold water from the depths and weaken the typhoon. Now that Trami is moving at a more rapid clip of 9 mph towards the north-northwest, the typhoon will move into warmer waters and begin to intensify. Trami will pass very close to Okinawa near 10 pm EDT Friday, then reach the southern main island of Japan near 8 pm EDT Saturday as a borderline Category 2/Category 3 storm with 110 - 115 mph winds.